"When a book is called a 'literary mystery,' what does that mean? Elegant writing, no street talk? Everything trumps plot? A body in the library? A mystery about books, maybe lost books, say a more focused Dan Brown? 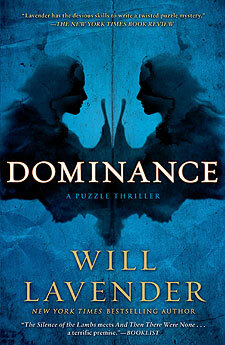 At last I have a clear example of a literary mystery thanks to Will Lavender's second novel, Dominance. We're in a college, a book world. One where a professor of literature—teaching from his prison cell—challenges his night class to find elusive and reclusive novelist Paul Fallows. Who is Fallows? Not even Fallows scholars know. Yet in order to secure entry to this elite community (think Yale), candidates have to play a mysterious literary game called the Procedure whereby they can master Fallows' two published novels. I can't help but think of my own college days at Stanford where the vogue was to master Ayn Rand's Atlas Shrugged although the risks were limited to embarrassment. So, if the Fallows' books are maps to the author's true identity, we have here a kind of Grail Quest for the Fallows Scholars team. If they all die, will the game continue? That's just one of the terrifying possibilities opened up by this brilliant and horrifying book that challenges characters and its readers on multiple levels." "Don't read Dominance by Will Lavender. Don't read this evil, fiendishly good thriller. Don't ask why a cold-blooded axe murderer would be permitted to speak to a group of college students, let alone teach a class. Dominance is about secrets, power, and murder. It's a disturbing book, where readers will definitely find themselves manipulated by the author. If you are foolish enough to start reading this book, be warned that you will not be able to stop. Leave the lights on, your killer will turn them off later." "Talk about a great psychological thriller. There were times while reading Dominance I was glad I wasn't home alone. It was scary, creepy and smart. The ending came as a complete surprise. Terrific book!" "I enjoyed it a great deal. It reminded me a slight bit of The Silence of the Lambs, which is a good thing. It's very suspenseful and had me guessing the entire time." "More than an academic mystery, more like a thriller, more of a tantalizing game then the player can win or die, in the attempt. Dominance has so many twists and turns that it forces the reader to think ahead and try to read and re-read in a search for the clues that lead to puzzles and unimagined discoveries of what may be the truth. Imagine yourself being invited to solve a long standing mystery with other graduate students whose desire to succeed is almost as intense as your own. Set on a placid college campus amidst professors, researchers, and authors it seems ironic to discover the presence of deadly secrets circulating among the chosen circle of graduate students. One of their peers was murdered and now...they must decide if they are willing to enter into the competition to solve the crime, as a group, or as individuals. The throbbing rhythms of the events along with very brief chapters keep readers' attention until the next crisis is revealed. If the readers are brave enough to join the game, there may be no sleeping tonight!" "Funerals bring old friends and enemies together. In Dominance the group reunites around the suicide of a classmate from a particularly peculiar class. Convicted killer, Professor Richard Aldiss, taught this course from prison in 1994. The course, a study of reclusive author, Paul Fallows, results in the professors release. But, that is only the start of the book. Students proceed with their lives, and one of them, Alex Shipley becomes a successful professor who is now called upon to solve the murder of a class member who is brutally killed and his body decorated with the books of Paul Fallows. In the background is the mysterious "Procedure," a game which the students have played in the past and is now part of their present. This literary mystery builds in tension until the reader becomes part of the Procedure and as curious about its rules as any character in the book. Dominance has the pace of a good piece of music. It rises and falls carrying the reader through to its climax." "From the first moment Richard Aldiss appeared on the TV screen, I became Clarice Starling—enraptured and horrified—as she was upon her first meeting with Hannibal Lecter. Richard Aldiss keeps you enmeshed in the ensuing story whether or not he is part of the immediate events. He is always there—in your mind, your heart and your soul. Will Lavender has written a story that is a masterful blend of suspense, psychology, mystery and good old fashioned creepiness!!!!!" "'The Procedure' was a game played by an elite group of college students—and one that got their professor out of jail. This literary mystery reads like a combination of Agatha Christie and Jeffrey Deaver. Years later, the Procedure seems to have returned and Alex Shipley, now a prof herself, joins a now-deadly game to find the killer among her former classmates. Dominance is gripping, grisly and scary!"